With an exceptional revenue growth of over 324.3% over the last three years, the San Diego Business Journal has ranked Clary Business Machines at No. 34 on the list of San Diego’s Fastest-Growing Privately Held Companies for 2009. 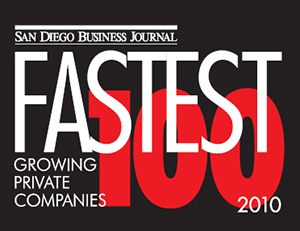 The list of the region’s 100 fastest growing companies is compiled annually by the San Diego Business Journal and is based on audited and verified company financial statements. This year’s list represented the four-year period from 2005 through 2009. It is the third consecutive year on the list for Clary Business Machines, which has also been ranked No. 940 on Inc. 5000’s list of Fastest Growing Companies in USA and No. 70 among Business Products and Services related companies. The San Diego Business Journal is an award-winning publication that examines the San Diego economy and offers analyses of the community’s ever-changing business and economic scene.